Vicki from 2 bags full is having a party on the 19th January and everyone is invited! 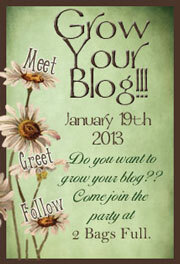 The idea is to "grow" our blogs by finding new blogs and 'meeting' new people. I think it's a fun idea, I already found this amazing giveaway through Vicki's blog as well as a couple of really great blogs that I'm excited to be following. Totally going to join you :) Thanks for letting us know about this one! I like to join you. I like short blogs but I still read a lengthy one if I like it. Thanks for sharing. Already there, Nikki :) Glad you joined it too!